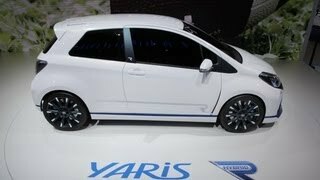 Toyota has unveiled the Toyota Yaris Hybrid R concept, concept car dedicated to maximising driving pleasure on road and on track, at the 2013 Frankfurt Motor Show in Germany. It is based on the Yaris 3-door. The model features a more aggressive design. It gets a new designed bumper, large air intakes, blue LED daytime running lights, flared fenders, an exclusive roof mounted spoiler, large diffuser with an exhaust pipe and 18-inch TRD wheels fitted with Michelin Pilot Sport Cup tyres. The interior gets dual tone Recaro bucket seats featuring black leather side bolsters and blue Alcantra which also covers door panels and the dashboard. The sport steering wheel is wrapped in Alcantara. The driving position is ideally completed by a set of GT 86 sport pedals. The Toyota Yaris Hybrid R concept is powered by a powerful and highly tuned 1.61 petrol engine combined with two powerful electric motors to an 'intelligent' electric four-wheel drive capability. The front wheels are driven by a 300hp 4-cylinder 1.6 turbo engine with direct injection. At the rear, each wheel is individually powered by a 60hp electric motor. The hybrid powertrain system develops a total system output of 420 hp. A 3rd 60hp electric motor, located between the engine and the 6 gear sequential transmission, operates as a generator in two different cases.